Montclair's July Fourth Parade Is No Joke! 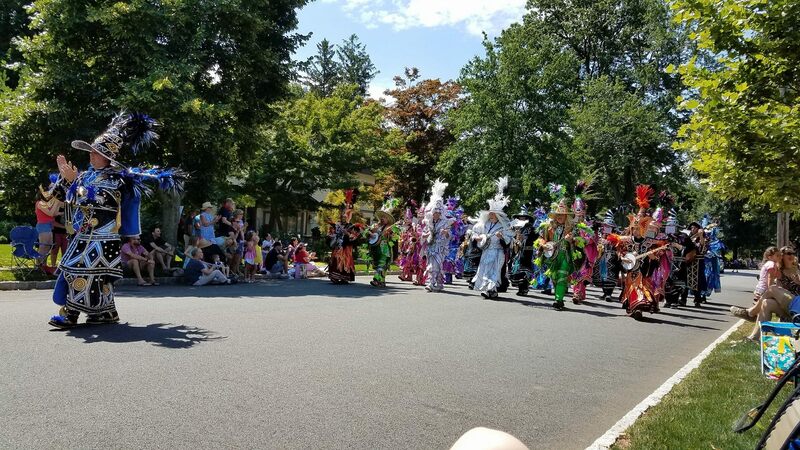 If you’re moving to Montclair and you happen to purchase a house on Midland Avenue, there will be a rider in your contract about the 4th of July – namely that you’re required to have a lawn party for the parade. Okay, I’m kidding about the rider but you’d never know it if you lived here. For as long as I’ve lived in Montclair, our July 4th Parade has been one of my favorite events. The parade starts around 11 o’clock at the library on South Fullerton Avenue, turns onto Bloomfield Avenue, and then travels the entire length of Midland Ave, ending up at Edgemont Park. It always begins with antique cars, then come the marching bands, local groups and businesses -- the beloved Community Pre-K marchers, the always-festive Egan and Sons’ float, the high school football team, the Boys Scouts, Bike and Walk Montclair, School of Rock. The list goes on and on. Midland Avenue is an extra wide street, centrally located and easily accessible. Some families pull a few lawn chairs to the curb and settle in for the festivities. Others set up food and drink for dozens of guests. For nearly two hours, this usually-quiet, mile-long block turns into a massive party – a meandering mingling, of happy and fun. If you happen not to buy a house on Midland, your first order of business should be to make friends with someone on the block so you have a parade perch. Actually, I’m kidding again. People from all over town stroll Midland’s sidewalks and can plop down on a curb anywhere. Still, I’ve heard of Midland Avenue sellers adding a clause in their contracts reserving a curb spot for their family in perpetuity. Here, I’m only half-kidding. Families often do return, year after year, to take in the music and merriment that is the Montclair July 4th Parade. We have so much pride in our town and community, and at the parade, it's like you can taste it.